Green tea is a non-fermented tea with qualities often known as “one tender and three greens”. 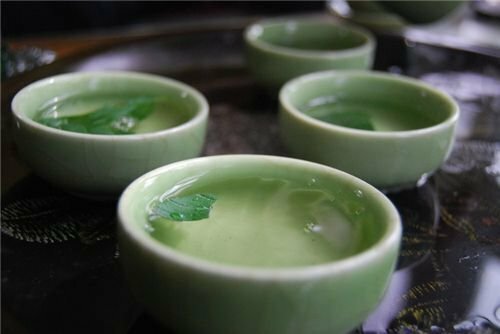 “one tender” refers to tender tea leaves, and “three green” refers to the green colored tea leaves, the green colored tea liquid, and the green colored tea dregs. Black tea is the complete fermented tea. It is bright red in color, mellow in taste and good at compatibility. 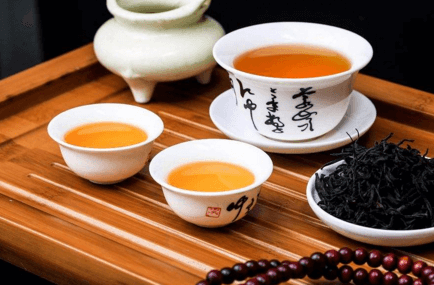 Black tea can be drunk alone, and also can be mixed with milk, cubic sugar, spidery, fruit juice or alcohol, to be served as appetizing romantic beverage. Oolong tea is semi-fermented tea. It is mainly grown in Fujian Province, Guangdong Province and Taiwan. 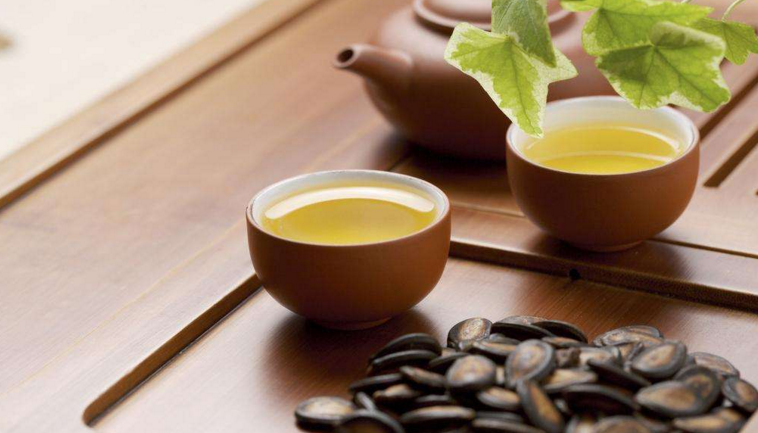 Oolong tea has big varieties, main types include Dahongpao Tea, Tieguanyin Tea, and Taiwan High Mountain Tea. “Water is the mother of tea.” The quality of water is essential to the flavor of tea. In tea ceremony, there are three types of water: water from the sky, water from the earth, and reprocessed water. “The water from sky” includes rainwater, snow water, frost, dew, and hail. “The water from the earth” includes the water from spring, river, brook, lake and well. 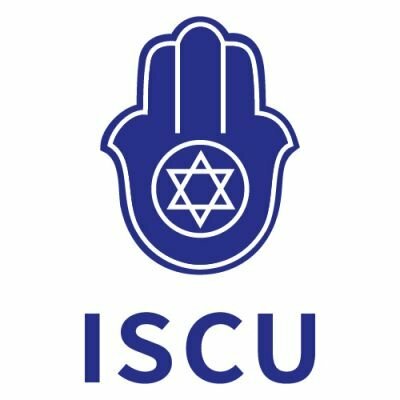 Tap water, pure water, space water, active water, and purified water are all the reprocessed water. The water from mountain spring is best water to make tea. Making different teas needs the water in different temperature. Making Oolong tea and Pu’er tea need 100℃ waters. Making Dragon Well Tea needs the temperature of water between 80 ℃ and 85 ℃. 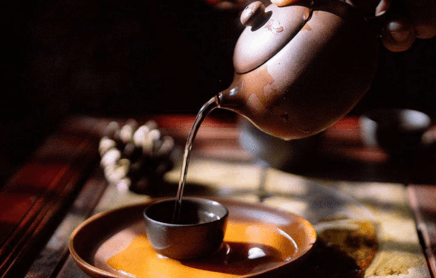 Making Biluochun tea from Dongting Mountain needs the temperature of water between 70℃-75℃. Making black tea or scented tea needs the water with the temperature of no lower than 95 ℃. The just boiling water can make the tea reach the best flavor. Brewing tea water should not be boiled too long. Keep heating up the boiling water may cause the water to loose its oxygen and carbon dioxide gas. The tea will not taste fresh. As Buddhist legend would have it, Mother Buddha, named Guanyin，the Goddess of Mercy, is always seen holding a white jade flask that contains holy dew that would cure all diseases. When we serve the tea we have made to our guests in teacups, we call it, “Guanyin holds the jade flask”, wishing you health and happiness. This is the most distinctive feature in Dragon Well tea ceremony. As you can see, in the waves of hot water, the tea sprouts slowly extend and spread themselves out, first like pointed spears and then like unfolding flags, which is why we call the tea leaves “spears and flags. ” One sprout with one leaf is called a spear, and one sprout with two leaves is referred to as a swallow’s tongue. As you give you teacup a gentle shake, you might see tea leaves dancing like green fairies coming to life. Take sniff of Dragon Well’s pure and elegant aroma. Your mind will became enlightened by the smell of the vibrant nature of the tea. Dragon Well tea has delicate aroma and fresh and mellow taste. As long as you put your mind to savor it, you will find the clearest, mellowest, purest and most wonderful taste from the light tea liquor. The first brewing of Dragon Well tea tastes sweet, the second brewing mellow, and the third brewing with lingering flavor. After the first brewing please refill your glass and find the joy of self-indulgence.